Oilfield Instrumentation, USA, Inc., an oilfield services company operating in at least 6 states, is another in a long line of employers ill-served by a medical examination vendor’s lack of fidelity to Title I of the Americans with Disabilities Act. In this case Acadian Health Services Clinic, a purveyor of occupational health services including functional capacity evaluation, provided a physical examination of Carl Devalcourt. Delvalcourt was in the conditional-hire phase of employment after a successful round of interviews with the hiring manager of Oilfield Instrumentation. The physician’s initial physical examination of Devalcourt determined that he was in “good physical shape” and that his diabetes was “well-controlled.” During the course of the examination the physician expressed his concern to Devalcourt that he had Type I insulin-dependent diabetes and yet wanted to work offshore. Devalcourt assured the physician that he was on an insulin pump, that he had two years of previous experience safely working offshore as a diabetic, and that he took necessary precautions to ensure his safety. Apparently absent from the conversation was any reference to a request for reasonable accommodation by Devalcourt. After the initial exam, the physician contacted Oilfield Instrumentation to inform the company that Devalcourt was a Type I insulin-dependent diabetic. In a letter addressed to Oilfield Instrumentation, the physician stated that Type I diabetics are “fragile” and determined that Devalcourt was not qualified for the position of service technician simply because he has that condition. Contrary to the results of the initial examination, Dr. Silva then informed Devalcourt that Oilfield Instrumentation was no longer interested in proceeding with the employment process. EEOC said that Oilfield Instrumentation did not base its decision to withdraw the job offer on the type of fact-intensive assessment mandated by the Americans with Disabilities Act (ADA). 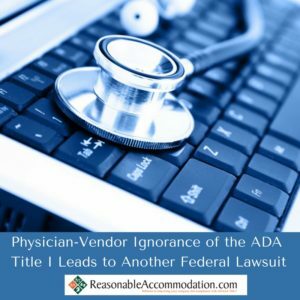 Rather, the company simply revoked the offer on the basis of a sweeping determination that Type I insulin-dependent diabetics could not work offshore, regardless of whether the particular diabetic employee could perform the essential functions of his job (with or without reasonable accommodation Ed.). the employer’s failure to engage and document a rigorous interactive conversation relative to reasonable accommodation to the employee’s disability-related issues. The fact that a simple conversation between the physician and the client company led to the offer withdrawal implies to me that other non-compliant procedures might well be present in the employer’s hiring regimen but where not encountered in the EEOC complaint because the hiring process was cut short. Follow the progress of this suit, filed in U.S. District Court for the Western District of Louisiana (EEOC v Oilfield Instrumentation, U.S.A., Inc., Case No. 6:16-cv-01089), at eeoc.gov/newsroom. Postscript: I have invested years of study, fieldwork, and professional development in quest of the knowledge base I now possess. As a result, I have achieved certification as an Americans with Disabilities Act Coordinator under a program created by the United States Department of Justice. This recognition, combined with the experience gained in 25 years of building and selling successful companies which serve the world of workplace health and safety, give me a unique perspective of ADA Title I. And so in the postscript to each of my blogs, I insert a “call to action” with the purpose of sharing with you how I can assist your understanding of federal employment law. If you have recently been charged with an EEOC discrimination infraction, I can assist you in organizing your reasonable accommodation interactive conversation documents so your legal counsel delivers data in a manner that will facilitate settlement the charges. In response to EEOC employment discrimination settlements, I am able to provide you with the corporate training required in your settlement agreement. If you are an employment law professional analyzing an ADA medical examination issue, my twenty-five years of experience will clarify the employment testing issues to the level of a qualified FRE 702 witness. Or, if you simply wish to preclude problems in the future, I can provide training to increase your knowledge of federal employment law. Tour our company web site at https://reasonableaccommodation.com/ for an example of the training and support we are able to provide.